Fenerbahce coach Vitor Pereira insists he has a "normal" relationship with Robin van Persie despite omitting the striker from recent starting line-ups. 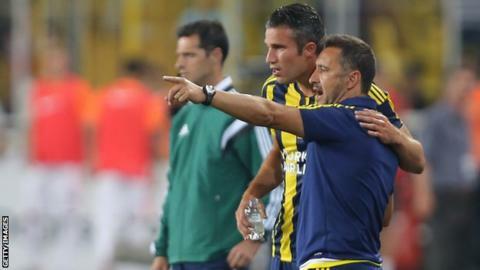 Van Persie is not happy as a substitute and the two shared a meek handshake after Sunday's defeat to Besiktas. Ahead of Thursday's Europa League tie with Celtic, Pereira said there are no problems between him and the Dutchman. "I have a great relationship with my team and players," the Portuguese manager said. "Sometimes the tensions are high. We want this team to get better and improve professionally. Robin van Persie is part of the team and we all want to get better. "Our relationship is based on trust in each other, confidence. We have our objectives. We have a normal relationship. "Sometimes high tension stuff happens, but in football we can solve these kind of situations perfectly. "Many times in football to win games you need these kinds of tensions. If we are all in the the calm tone you can't win the games. "These kind of things are normal to us, the people who work for the club. We live it and forget it, but I understand the press point of view, you would like to make news about it. It happens fast but we solve it fast too." Van Persie has scored in the last two games, coming off the bench on both occasions. Fenerbahce sit second in the Turkish Super Lig after Sunday's derby defeat and Pereira is expecting a tough game against Celtic, having lost their opening tie at home to Molde. "We will play against a well-organised team that plays with aggression and intensity," he added. "They know how to make counter-attacks and transitions from defence to attack, especially when they play at home with the support of their fans. "It will be a tough game for us, intense, they have good players. They have so much experience in the last couple of years in the Champions League, so they know how to play at that level. It will be a high quality game." Fenerbahce star Nani admits to not knowing much about the current Celtic side. But he has played at Celtic Park for Sporting Lisbon and in the Champions League for Manchester United. "What I can remember was that it was very tough, very emotional," he said of the 1-1 draw in 2008. "We know the atmosphere here and it will be a hard game for our team. "We are prepared, we have worked very hard for this moment. It's a team who likes to attack when they play at home, they have a strong mentality until the last minute, like in England. "We can expect a physical game because the Celtic team used to be very strong and similar to English football. My first game here was hard, I was too young and the manager was shouting at me to be strong. "This is part of the game. Strong tackles tomorrow - no problem."